The Goldfish is worked flat in beaded knitting (described in pattern). The fins are picked up and knit onto the body. There is only one seam. 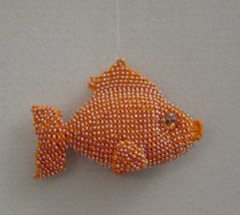 One hank of seed beads and one ball of DMC will make at least two fish. Kits are available from FiberSpace. Call 877-467-0382 for details.